P.S. You're Lovely: What Do We Think? As promised, I'm looking to you when adding new products to PSYL. I was in Dallas this past weekend at a bead shop and I saw these cute clay flowers. I think they would look so cute on a necklace. Possibly the Jackie O... tell me what you think. Leave your opinions in the comments! Thanks everyone! Okay, I love this. 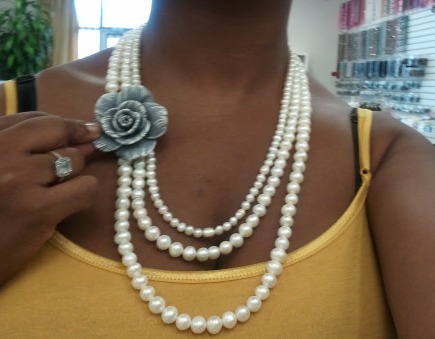 Will it be on the Jackie O I just ordered( hint, hint) It would also look great on a pair of black pearls. Ooh let me do some research. That sounds cute. Keep the ideas coming!